Check out my vlog to see just how beautiful the Kashima-Jingu shrine really is! The Kashima-Jingu shrine is dedicated to Takemikazuchi, the ancient god of thunder and martial arts. After the Father of Japan, Izanagi, beheaded his own son as a punishment, it is said that Takemikazuchi sprung from the blood that splashed onto the rocks from Izanagi’s sword. With Takemikazuchi, Futsunushi was also born. Both gods are revered and respected as gods of martial and military arts. This shrine is the oldest shrine in the entire Kanto region and is one of the Three Shrines of the East in Japan. 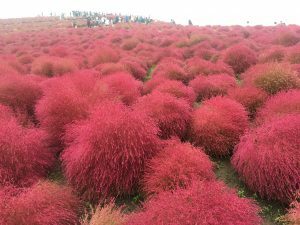 It is assumed to have been founded in 660BC, during Emperor Jimmu’s first year. The entrance of the shrine, the Romon, is one of the largest gateways in Japan! It is also considered to be an important cultural property and is one of many important aspects of the shrine. There are many historical artifacts stored within the treasure hall inside the shrine. One of the artifacts is Japan’s longest and oldest sword. Unfortunately, I was unable to go into the treasure hall so I didn’t get to see the sword. The bright red gateway showed us exactly where we needed to go. In some parts of Japan, deer are considered to be messengers of the gods and are admired greatly due to their significance in the Shinto religion. Deer are sacred animals and can be found in the “deer park” in the Kashima-Jingu shrine, among a few other places around Japan. The deer park in the Kashima-Jingu Shrine. After wandering around the shrine and immersing yourself in the natural beauty that surrounds the shrine, you can buy an amulet (omamori) as a lucky souvenir. The ones I saw said “Traffic safety” and “Good luck on exams”. The omamori are made by women who work at the shrine. At the Kashima-Jingu shrine, they wear the traditional styled clothing of the red skirt and white top. Even more omamori! Buy all the luck you can! I hope you enjoyed this post! 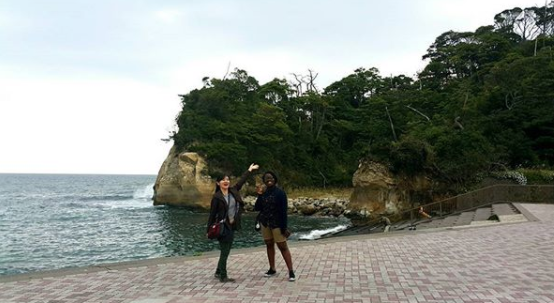 I will try to be posting every other day on my personal blog so follow me to keep up with my adventures in Japan! I recommend brushing up on your Shogi before travelling to Japan. This is a game similar to checkers and chess. 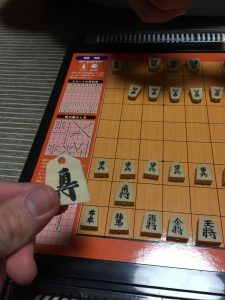 It helps if you know kanji before hand but the more you play the more you will become familiar with this unique game. Cllick the image to see the rules. Before you become an intern at IC you are given a choice of living with a home stay family or living in an apartment. Both choices have terrific benefits during the internship. 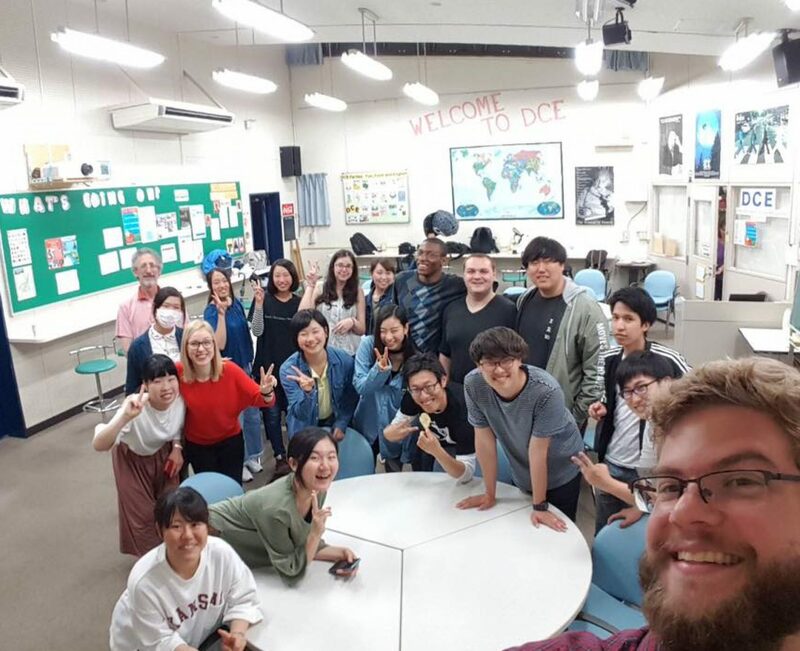 I jumped at the opportunity to stay with a family during my two month stay in Ibaraki for my internship at DCE. 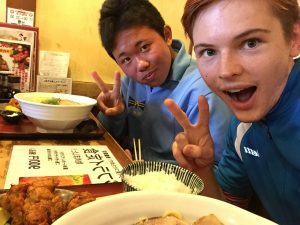 I am learning to speak and write a new language with the parents, I eat delicious foods around Ibaraki at places like Mito, Kasama and Hitachi, and I have introduced their son to ukulele. 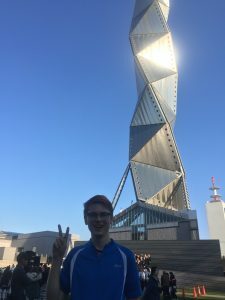 Visiting different attractions have been incredible such as the Mito City Tower. The family have a study school on the property. The mother works hard to teach students English, mathematics, science, history, geography and much more. I read manga like Naruto for a break while enjoying milk and Japanese snacks. This provides an extra teaching opportunity with younger students. The ritual every morning for my home stay family is centered around the breakfast table. I am thankful for every meal. Each and every morning you wake up, you say good morning and thank the family for cooking the meal. On weekends we go out to see my host brothers soccer game. It helps to be interested in soccer, and show a genuine interest in the interests and hobbies the family enjoy doing too. I asked another intern, Martin Chan about their home stay experience. He compares the quality of the food as a feast, better than a restaurant. My home stay family are accommodating and kind. Thank you for this incredible opportunity. 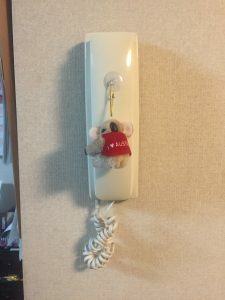 I have been given the opportunity to understand what it is like to live like a Japanese person day to day. 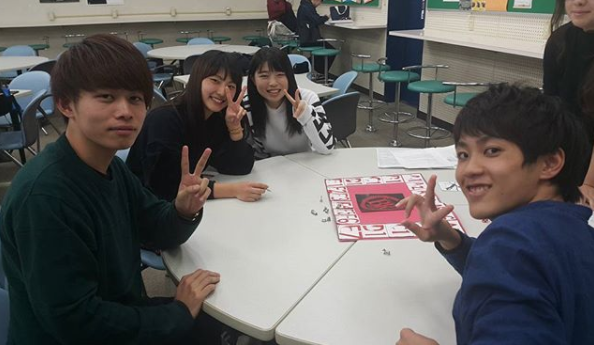 What are Students like at Ibaraki Christian? 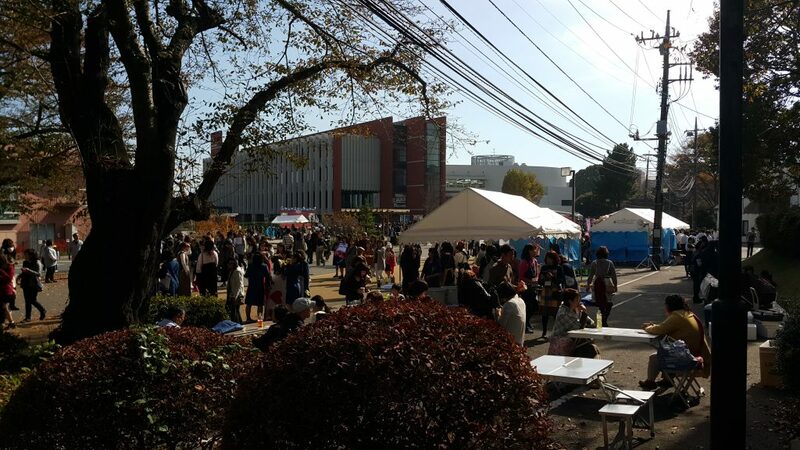 Many applicants wonder what the students at Ibaraki Christian University are like. 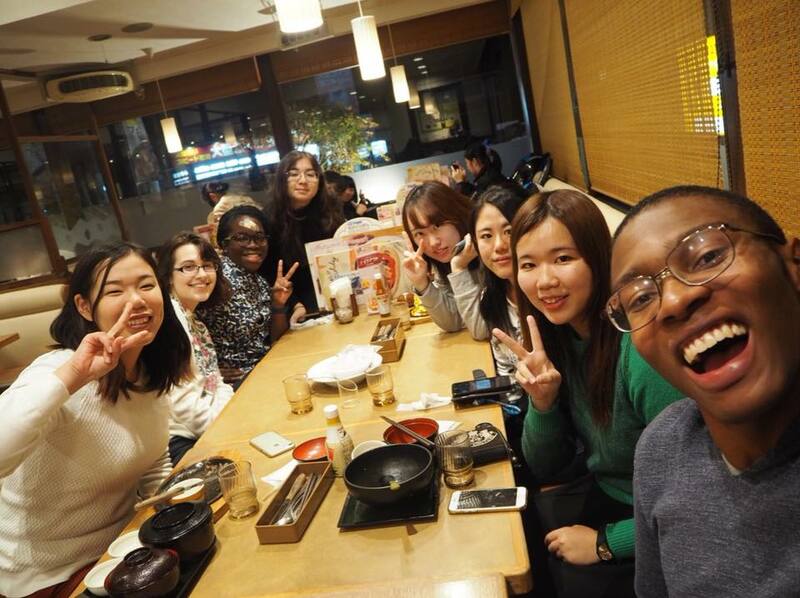 After all, as an intern you spend most of your time working with students in small groups during chat hour, one on one for English homework help and TOEFL (Test of English as a Foreign Language) or TOEIC (Test of English for International Communication) preperation, and in English Conversation Classes every week. Future interns might be afraid that the students won’t be very friendly, won’t be interested in talking to them, or so on. But I can absolutely reassure you that this is not the case. Students playing Pictionary while waiting for cookies to bake in Chat Hour. The students can certainly be quiet and reserved during chat hour, and there will be times when you have to sit and stare at each other and wait until they finally feel so uncomfortable that they say something. But if you put in the effort to get to know the students, do fun activities with them, and above all, be patient with them, they will slowly become more comfortable and more active in trying to speak with you. It’s rarely that they don’t want to talk with you, but simply that they’re nervous about talking in English. Students playing Lizzete’s Battle Royale Game! They’re also more than happy to make friends with you! Be warned, students have very busy schedules–if you ask them what they’re doing on the weekend or on a given evening, the answer will more often than not be something like “studying for my three tests next week”, “working at my part time job”, “going to a make up class” or so on. But if you ask to hang out, chances are they will want to when they have time. Interns and students enjoying dinner at CoCo’s. 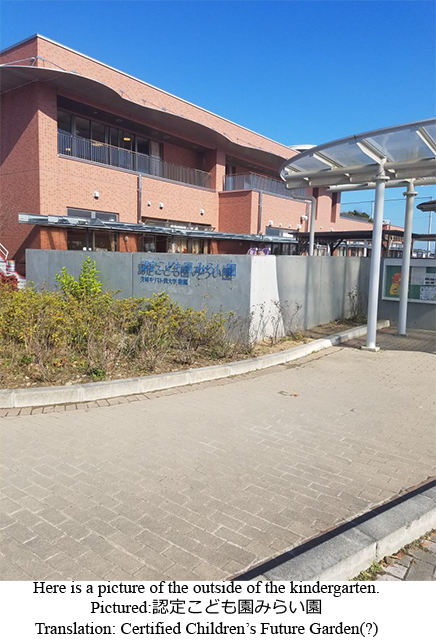 I’ve gone to Licca-chan Castle with a student and her mother, gone out to karaoke with students, gone shopping with students, gone out to eat with students, gone sightseeing with them, gone to cat cafes with them, and even gone to Tokyo for a day trip with them. Each and every time was a wonderful experience that I wouldn’t trade for the world. Miho and Brianna when we visited Hananuki Dam. You don’t have to worry about not getting along with the students when you come–only how much you’ll miss them when you leave. On these days, Onaca, Lizzete, and I (Brianna) had the pleasure of attending Ibaraki Christian’s very own kindergarten! It was an experience to go down in the books. We made our way with Rory to the facility, to be greeted with utmost kindness, and of course cuteness by not only the staff, but some kindergarteners as well! Like most Japanese schools, we must take off our shoes. We could either sport the facility’s slippers, or our very own indoor shoes. After a brief tour of the facility, we were instructed to wait until being greeted by the respective kindergarten teachers. Once greeted, we were led into the classroom, only to be swept away by those oh-so-cute faces of the kindergarteners! We can justify this, they were NOT shy. On the first day, October 17th, we were to teach the 4-year-old classes, Nozomi (hope) 1 & 2. To kick things off, we instructed them to gather and sit in a circle. Using our bodies and arms, we made a circle. They understood, and did as so. The three of us introduced ourselves, and got quite the reactions, some I will not forget. Lizzete and I gave shortened versions of our names; Liz and Bri. When Onaca (AH-NAH-KA) introduced herself, we were received with giggles–I believe they heard onaka (OH-NAH-KA), the Japanese word for stomach. It was quite funny. Moving along, we wanted to get the children moving (heh, see what I did there?). We began with Total Physical Response (TPR). We gave them commands such as: stand up, sit down, touch the floor, point to the door (ooh, that rhymes! I’m on fire! ), stomp, and clap. We ourselves did it along with them. To be silly, we consequentially made them stand up, only to sit back down shortly afterwards. They got quite the kick out of that. Onwards, we gathered round back into a big circle and introduced them to body parts with pictures: head, shoulders, knees, toes, eyes, ears, mouth, and nose. For head, we had a picture of Monkey D. Luffy from One Piece. He was quite a hit. We then closed with “Head, shoulders, knees, and toes” and the “Hokey Pokey” and said our goodbyes. The second and final time, we got a better understanding of the kids and how to use our time. Unfortunately, it is a process and will take much more than two times to perfect our lesson. This time, we were with the Ai (love) 1 & 2 class. These were the 5-year-olds. Even though a year older, they were still not shy. We pretty much did the same lesson, with minor revisions and better management of time. The 5-year-olds, however had a significantly greater retention of the vocabulary that was presented to them, and were much more responsive. We had a long weekend last week–no school Wednesday, Thursday, or Friday! The long break didn’t make for an empty campus though. In fact, it was more packed than ever! Why, you ask? Well, because it was the bunkasai! Or, in English, the culture festival. 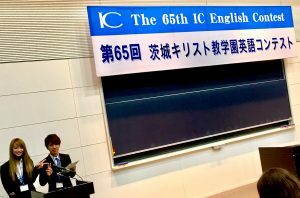 It was the 65th Ibaraki Christian English Speech Contest. In a busy yet rather smooth morning, many junior high school and high school students walked in with their teachers and parents. Indeed, there were many nervous faces. But, I could clearly see that they were ready to take up the challenge of speaking in front of a large crowd, using their second language. Of course, some were maximizing their final minutes to practice with their teachers to gain some extra confidence. 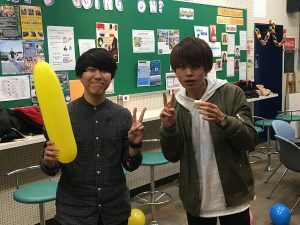 There were 5 events: Junior high school recitation, Junior high school and High school pronunciation, Junior high school speech, and High school presentation. As an “English-as-a-second-language” (ESL) learner myself, I could resonate with the challenge of overcoming the influence of our mother tongue, to pronounce English words accurately. I was particularly impressed with the high schoolers who did presentations. They’ve internalized their contents. Despite unexpected hiccups and interruptions, they were able to rise above the occasion and delivered their presentations with confidence. Everyone looking happy and on various levels of sugar highs at the end of the party. 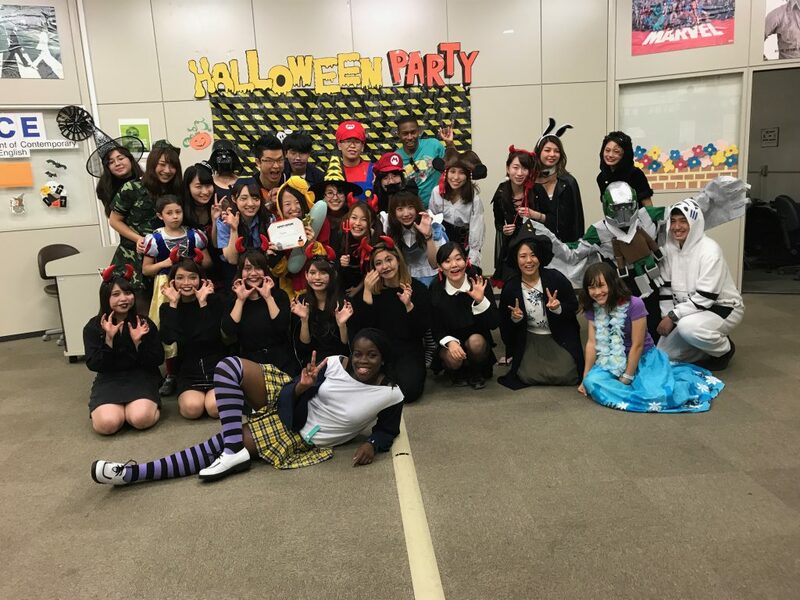 Last Friday, after weeks of planning, we finally had the joint DCE and EPH Halloween party! The 20th is a little early, I know, but Japan doesn’t exactly celebrate Halloween like America does. Halloween parties, while not a rarity, aren’t the norm, there’s no trick-or-treating, and you’ll very rarely see anyone out and about in costumes on Halloween. Only one thing seems to remain the same–commercialism. Halloween goods are in every convenience store, Daiso, and shopping mall. With all this in mind, I doubt the students gave a second thought to the Halloween party not being on Halloween. And regardless of the timing, the Halloween party was a blast! We started the night out by teaching The Time Warp to the students to get them energized and make them laugh a little at our antics. Originally, we had planned to do the Thriller dance, but pro tip there: It takes longer than a half hour to learn.